Aviation related terms and definitions used in association with civil flight obtained from the Code of Federal Regulations, Federal Aviation Regulations, and many other sources (general abbreviations and those specific to myAviationHUB can be found on our Codes page). Cross references are in CAPITAL letters. ABSOLUTE ALTITUDE – The measureable height of an aircraft above the actual terrain. ABSOLUTE CEILING – The maximum altitude above sea level at which an aircraft can maintain level flight under Standard Air conditions. ACCELERATED STALL – Any stall made to occur at other than 1g. ACCESSORY GROUP – Mechanical and electrical units mounted on an engine necessary for its operation, such as starter, magnetos, fuel pumps, etc. ADCOCK RANGE – National low-frequency radio navigation system (c.1930-c.1950) replaced by an omnirange (VOR) system. It consisted of four segmented quadrants broadcasting Morse Code “A” (dot-dash) and “N” (dash-dot) signals in opposing quadrants so that pilots could orient their position relative to a “beam” broadcasting a steady tone, and a Morse Code station identifier. Using a “build-and-fade” technique, a pilot could (ideally) pinpoint his location by the strength or weakness of a signal. Read about it here. ADF – Automatic Direction Finding via automated radio. ADIABATIC LAPSE RATE – The rate at which ascending air cools and descending air warms, given that no heat is added or taken away. The rate for dry air (DALR) is based on 5.4° F per 1000′ altitude (1° per 100 meters). Moist or saturated rates (SALR) vary with barometric pressures and temperatures and must be adjusted for accuracy. ADVERSE YAW – Yaw generated when the ailerons are used. The lifting wing generates more drag, causing an airplane to yaw (turn) toward it. AGL – Above Ground Level, as a measurement of altitude above a specific land mass, and differentiated from MSL. AIR DEFENSE IDENTIFICATION ZONE (ADIZ) – The area of airspace over land or water, extending upward from the surface, within which the ready identification, the location, and the control of aircraft are required in the interest of national security. Domestic Air Defense Identification Zone – An ADIZ within the United States along an international boundary of the United States. Coastal Air Defense Identification Zone – An ADIZ over the coastal waters of the United States. Distant Early Warning Identification Zone (DEWIZ) – An ADIZ over the coastal waters of the State of Alaska. ADIZ locations and operating and flight plan requirements for civil aircraft operations are specified in FAR Part 99. AIRFOIL – The shape of any flying surface, but principally a wing, as seen in side-view (“cross-section”). Its characteristics are Center of Pressure (CP), DRAG (CD), LIFT (CL), Lift-Drag Ratio (L/D), and Moment (CM). AIR ROUTE TRAFFIC CONTROL CENTER (ARTCC) or “CENTER” – A facility established to provide air traffic control service to aircraft operating on IFR flight plans within controlled airspace and principally during the en route phase of flight. When equipment capabilities and controller workload permit, certain advisory/assistance services may be provided to VFR aircraft. AIR SPEED INDICATOR – An instrument or device that measures the air speed of an aircraft through an air mass, but not its ground speed. AIR TAXI – An aircraft operator who conducts operations for hire or compensation in accordance with FAR Part 135 in an aircraft with 30 or fewer passenger seats and a payload capacity of 7,500# or less. An air taxi operates on an on-demand basis and does not meet the “flight scheduled” qualifications of a commuter. AIR TRAFFIC CONTROL (ATC) – A service operated by the appropriate authority to promote the safe, orderly, and expeditious flow of air traffic. AIRPORT TRAFFIC CONTROL TOWER (ATCT) – A terminal facility that uses air/ground communications, visual signaling, and other devices to provide ATC services to aircraft operating in the vicinity of an airport or on the movement area. Authorizes aircraft to land or takeoff at the airport controlled by the tower or to transit the Class D airspace area regardless of flight plan or weather conditions (IFR or VFR). A tower may also provide approach control services (radar or non-radar). ALCLAD – Trademark name of Alcoa for high-strength sheet aluminum clad with a layer (approximately 5.5% thickness per side) of high-purity aluminum, popularly used in airplane manufacture. ALTIMETER – An adjustable aneroid-barometric cockpit instrument used to measure an aircraft’s altitude. AMPHIBIAN, AMPHIBION – A SEAPLANE or FLOATPLANE with retractable wheels for use on land, as well. The latter spelling was used in the ’20s and ’30s but has since fallen out of favor. ANGLE OF ATTACK – The acute angle at which a moving airfoil meets the airstream. ANGLE OF INCIDENCE – The angle at which an airfoil is normally fixed in relation to the longitudinal axis of an aircraft. ANHEDRAL – The downward angle of a wing in relation to a horizontal cross-section line; aka CATHEDRAL. See DIHEDRAL. APRON – The hard-surfaced or paved area around a hangar. ARM – In aircraft weight and balance, as well as load distribution, it is the distance from the CENTER OF GRAVITY (c/g) to some point. For computations, arms measured forward from the c/g are positive (+n) and those measured aft of the c/g are negtive (-n). ARTIFICIAL HORIZON – A vacuum-powered panel instrument that displays pitch and roll movements about the lateral and longitudinal axes; aka Attitude Indicator. ASPECT RATIO – The ratio of the span to the chord of an airfoil—a high-aspect ratio wing has wide span and narrow chord, and vice-versa for a low-aspect ratio wing. ATC – (1) Aircraft license as Approved Type Certificate, see ATC; (2) AIR TRAFFIC CONTROL. AUTOGYRO, AUTOGIRO – An aircraft, often wingless, with unpowered rotary airfoil blades that auto-rotate and serve as wings as they move through the air when mounted on a powered aircraft (or, in some cases, a glider). The latter spelling is a trademark of the Autogiro Corporation. AUTO-ROTATION – Automatic rotation of rotary blades from a helicopter in an unpowered glide or the forward movement of an autogyro. AUTOMATIC TERMINAL INFORMATION SERVICE (ATIS) – Continuous broadcast of recorded non-control information in selected terminal areas, to improve controller effectiveness and to relieve frequency congestion by automating repetitive transmissions of essential but routine information. BALANCED CONTROL SURFACE – A movable control surface, as an aileron or rudder, having an added physical extension or weights forward of the hinge-point to reduce forces on a joystick or yoke. See ELEPHANT EARS (2). BERNOULLI EFFECT or LAW or THEOREM – Since the pressure of a fluid is proportional to its velocity, airflow over the upper surface of an airfoil causes suction [lift] because the airstream has been speeded up in relation to positive pressure of the airflow on the lower surface. BLEED AIR – Hot air at high pressure, usually from the bypass section of a gas turbine engine, for de-icing, heating, and other uses. BOUNDARY-LAYER CONTROL – The design or control of slotted or perforated wings with suction methods to reduce undesirable aerodynamic effects caused by the boundary layer—that region adjacent to the boundary where shear stresses dominate in the airflow over a wingform. BUMPED COWLING – An engine FAIRING, generally circular, with welts or compound shapes in its surface to accommodate cylinder heads. CABANE STRUT – Wing strut attached to the fuselage. CALIBRATED AIRSPEED (CAS) – The indicated airspeed of an aircraft, corrected for position and instrument error. CAS is equal to true airspeed in standard atmosphere at sea level. Compare INDICATED AIRSPEED and TRUE AIRSPEED. CAMBER – The convex or concave curvature of an airfoil. CANARD – An arrangement in which the horizontal stabilizer and elevators of an aircraft are mounted in front of the main wing(s). CAVU – Ceiling and Visibility Unlimited; ideal flying weather. CEILING – (1) The heights above the earth’s surface of the lowest layer of clouds or obscuring phenomena that is reported as “broken,” “overcast,” or “obscuration,” and not classified as “thin” or “partial”. (2) The maximum height above sea level in STANDARD AIR attainable by an aircraft under given conditions—see ABSOLUTE CEILING, SERVICE CEILING. CENTER – An Air Route Traffic Control Center (ARTCC). CENTER OF GRAVITY (c/g) – The longitudinal and lateral point in an aircraft where it is stable; the static balance point. CERTIFICATED AIRPORT – An airport operating under FAR Part 139. The FAA issues airport operating certificates to all airports serving scheduled or unscheduled air carrier aircraft designed for more than 30 passenger seats. Certificated airports must meet minimum safety standards in accordance with FAR Part 139. CHORD – The measurable distance between the leading and trailing edges of a wingform. CLASS G AIRSPACE (Uncontrolled Airspace) – Airspace not designated as Class A, B, C, D or E CONTROLLED AIRSPACE. COAMING – A padded, protective rim around an open cockpit. COLLECTIVE PITCH – A cockpit control that changes the PITCH of a helicopter’s rotor blades; used in climbing or descending. COLLECTOR RING – A circular duct on a radial engine into which exhaust gases from its cylinders are safely discharged. COMMON TRAFFIC ADVISORY FREQUENCY (CTAF) – A frequency designed for the purpose of carrying out airport advisory practices while operating to or from an airport without an operating control tower. The CTAF may be a UNICOM, Multicom, FSS, or tower frequency and is identified in appropriate aeronautical publications. COMMUTER – An air carrier operator operating under 14 CFR 135 that carries passengers on at least five round trips per week on at least one route between two or more points according to its published flight schedules that specify the times, day of the week, and places between which these flights are performed. The aircraft that a commuter operates has 30 or fewer passenger seats and a payload capability of 7,500# or less. COMPASS COURSE – A bearing as indicated by the horizontal angle between the compass needle and the centerline of the aircraft. A Compass Course is equal to a True Course ± variation and deviation; also equal to a Magnetic Course ± deviation. COMPASS NORTH – The North point at which a liquid compass needle points, rather than Geographical, or True, North. Compare MAGNETIC NORTH. CONE OF SILENCE – Click the Adcock page. CONSTANT-SPEED PROPELLER – A hydraulically-controlled propeller that governs an engine at its optimum speed by the blade pitch being increased or decreased automatically. CONTACT FLIGHT – Navigation in which altitude and flight path can be maintained by visual reference to the ground and its landmarks. Similar to VFR. CONTOUR FLIGHT – Contact Flight in and around mountainous areas following visual reference to the terrain’s countours. CONTRAIL – Trailing streak of condensed water vapor created in the air by heat from an aircraft engine at high altitudes; aka VAPOR TRAIL. CONTROLLED AIRSPACE – An airspace of defined dimensions within which air traffic control service is provided to IFR flights and to VFR flights in accordance with the airspace classification. Controlled airspace is a generic term that covers Class A, B, C, D, and E airspace. Controlled airspace is also that airspace within which all aircraft operators are subject to certain pilot qualifications, operating rules, and equipment requirements in FAR Part 91. For IFR operations in any class of controlled airspace, a pilot must file an IFR flight plan and receive an appropriate ATC clearance. Each B, C, and D airspace area designated for an airport contains at least one primary airport around which the airspace is designated (for specific designations and descriptions of the airspace classes, refer to FAR Part 71). Class A (formerly PCA – Positive Control Area) generally, that airspace from 18,000′ mean sea level (MSL) up to and including flight level (FL) 600 (60,000′ pressure altitude), including the airspace overlying the waters within 12 nautical miles of the coast of the 48 contiguous States and Alaska. Unless otherwise authorized, all persons must operate their aircraft under IFR. Class C (formerly ARSA – Airport Radar Service Area) Generally, that airspace from the surface to 4,000′ MSL above the airport elevation surrounding those airports that have an operational control tower, are serviced by a radar approach control, and that have a certain number of IFR operations or passenger enplanements. Although the configuration of each Class C area is individually tailored, the airspace usually consists of a surface area with a 5 nautical mile (nm) radius, an outer circle with a 10 nm radius that extends from 1,200′ to 4,000′ above the airport elevation and an outer area. Each person must establish two-way radio communications with the ATC facility providing air traffic services prior to entering the airspace and thereafter maintain those communications while within the airspace. VFR aircraft are only separated from IFR aircraft within the airspace. Class D (formerly ATA – Airport Traffic Area and CZ – Control Zone) Generally, that airspace from the surface to 2,500′ MSL above the airport elevation surrounding those airports that have an operational control tower. The configuration of each Class D airspace area is individually tailored and when instrument procedures are published, the airspace will normally be designed to contain the procedures. Arrival extensions for instrument approach procedures may be Class D or E airspace. Unless otherwise authorized, each person must establish two-way radio communications with the ATC facility providing air traffic services prior to entering the airspace and thereafter maintain those communications while in the airspace. No separation services are provided to VFR aircraft. Class E (formerly General Controlled Airspace) Generally, if the airspace is not Class A, B, C, or D, and is controlled airspace, it is Class E airspace. Class E airspace extends upward from either the surface or a designated altitude to the overlying or adjacent controlled airspace. When designated as a surface area, the airspace will be configured to contain all instrument procedures. Also in this class are Federal airways, airspace beginning at either 700′ or 1,200′ AGL used to transition to/from the terminal or enroute environment, enroute domestic, and offshore airspace areas designated below 18,000′ MSL. Unless designated at a lower altitude, Class E airspace begins at 14,500′ MSL over the USA, including that airspace overlying the waters within 12 nautical miles of the coast of the 48 contiguous States and Alaska, up to, but not including 18,000′ MSL, and the airspace above Flight Level 600. CONVENTIONAL GEAR – Having two main landing wheels at the front and a tailwheel or tailskid at the rear as opposed to having a tricycle gear with three main wheels. Such an aircraft is popularly called a TAILDRAGGER. COWL, COWLING – A circular, removable FAIRING around an aircraft engine (generally radial) for the purposes of streamling or cooling; aka RING COWLING. COWL FLAP – A controllable louvre to regulating airflow through an engine’s cowling. CRAB – A rudder-controlled yawing motion to compensate for a crosswind in maintaining a desired flight path, as in a landing approach. DEAD RECKONING – In pioneer flight before radio, beacons, and accurate maps, flying distances much by instinct and guesswork, and referring to whatever landmarks were below, was quite routine. The “dead” part simply meant “straight,” as in the nautical “dead ahead,” and pilots often relied heavily on the IRON COMPASS for cross-country flights over unfamiliar territory. DEADSTICK – Descending flight with engine and propeller stopped. DECALAGE – The difference in angular settings [Angles of Attack] of the wings of a biplane or multiplane. DECISION HEIGHT – With respect to the operation of aircraft, the height at which point a decision must be made during an instrument approach to either continue the approach or to execute a missed approach [abort]. DELTA-WING – A triangularly-shaped aircraft wing having a low aspect ratio, a sharply-tapered leading edge, a straight trailing edge, and a pointed tip. DEPARTURE STALL – A stall in the takeoff configuration with power. DEVIATION (MAGNETIC) – The error of a Magnetic Compass due to inherent magnetic influences in the structure and equipment of an aircraft. DIHEDRAL – The acute angle, usually upward, between the wing of an airplane and a horizontal cross-section line. Opposite of ANHEDRAL. DIRECTIONAL GYRO – A panel instrument providing a gyroscopic reading of an aircraft’s compass heading. DIRIGIBLE – A lighter-than-air craft capable of being propelled and steered for controlled flight. Latin: dirigo,to steer. DME – Distance Measuring Equipment, a radio navigation device that determines an aircraft’s distance from a given ground station, as well as its groundspeed and time to/from the station. DOPE – Preservative and pigmented coloring for fabric aircraft covering and paints, generally nitrate lacquer but generically used to denote all early shellac and coal-tar mixtures on up to present-day acrylics. DORSAL FIN – A lateral fin/rudder extension on the top of a fuselage. Opposite of VENTRAL FIN. DOWNWASH – The air deflected perpendicular to the direction of movement of an airfoil. DRAG – The resisting force exerted on an aircraft in its line of flight opposite in direction to its motion. Compare THRUST. DRAG WIRE – A wire designed to resist DRAG forces, usually running from a forward inboard point to an outboard aft point. DRIFT – The angle between the heading of an aircraft and its Track [flight path] over the ground as affected by winds. DRY WEIGHT – The weight of an engine exclusive of any fuel, oil, and coolant. DURAL – Originally a tradename for a wrought aluminum-copper alloy created by Bausch Machine Tool Co, now fallen into generic use as any aluminum alloy containing 3.0-4.5% copper, 0.4-1.0% magnesium, and 0.1-0.7% manganese. Alcoa’s version is commonly referred to as “Duraluminum,” popularly used in aircaft manufacture. DZUS FASTENER – (“Zoose”) Very singular to aircraft, a patented slotted screw that binds to a wire for fast release and securing of cowlings and inspection plates, requiring no special tool other than a quarter coin. EARTH-INDUCTOR COMPASS – One whose indications depend on the current generated in a coil revolving in the earth’s magnetic field. ELEPHANT EAR – (1) An air intake characterized by twin inlets, one on each side of the fuselage. (2) A type of balanced aileron in which the outer edges are noticeably larger than the control itself. See BALANCED CONTROL SURFACE and example Travel Air 4000. ELEVATOR – The movable part of a horizontal airfoil which controls the pitch of an aircraft, the fixed part being the STABILIZER. ELEVON – A hinged device on the rear portion of an aircraft wing combining the functions of an elevator and an aileron. Usually found on delta-wing aircraft, it can be moved in the same direction on either side of the aircraft to obtain longitudinal control, or differentially to obtain lateral control. Also see FLAPERON. EMPENNAGE – An aircraft’s tail group, includes rudder and fin, and stabilizer and elevator. Old French: empenner, to feather an arrow, from Latin penna, feather. EN ROUTE AIR TRAFFIC CONTROL SERVICES – Air traffic control services provided aircraft on IFR flight plans, generally by centers, when these aircraft are operating between departure and destination terminal areas. When equipment, capabilities, and controller workload permit, certain advisory/assistance services may be provided to VFR aircraft. ETA – Estimated Time of Arrival. ETD – Estimated Time of Departure. FAIRING – An added streamlining structure or auxiliary member, most often of light metal, whose only purpose is to reduce drag. Fairings are not load-bearing and, therefore, are not meant to carry any principal air loads placed on the airplane structure. FBO – Fixed-Base Operator. A commercial operator supplying fuel, maintenance, flight training, and other services at an airport. FEATHERING – In the event of engine failure, the process of adjusting a controllable-pitch propeller to a pitch position where the blade angle is about 90° to the plane of rotation in order to to stop its windmilling and lessen drag. FERRY FLIGHT – A flight for the purpose of (1) returning an aircraft to base; (2) delivering an aircraft from one location to another; (3) moving an aircraft to and from a maintenance base. Ferry flights, under certain conditions, may be conducted under terms in a special flight permit. FIN – The fixed part of a vertical airfoil that controls the yaw of an aircraft; the movable part being the RUDDER. Sometime referred to as Vertical Stabilizer. FIREWALL – A fire-resistant bulkhead that isolates the engine from other parts of an airplane’s structure. FISHTAILING – A rudder-controlled side-to-side [yawing] motion to reduce air speed, generally prior to landing. FIVE-BY-FIVE (5×5) – In radio jargon, affirms that a radioed transmission was received as clear and loud. Rated one to five, with the first figure for clearness and the second second for loudness. FLAP – A movable, usually hinged AIRFOIL set in the trailing edge of an aircraft wing, designed to increase LIFT or DRAG by changing the CAMBER of the wing or used to slow an aircraft during landing by increasing lift. Also see FOWLER FLAP, SLOTTED FLAP, and SPLIT FLAP. FLAPERON – A control surface combining the functions of a FLAP and an AILERON. FLARE – A simple maneuver performed moments before landing in which the nose of an aircraft is pitched up to minimize the touchdown rate of speed. FLIGHT ENVELOPE – An aircraft’s performance limits, specifically the curves of speed plotted against other variables to indicate the limits of speed, altitude, and acceleration that a particular aircraft cannot safely exceed. FLIGHT LEVEL (FL) – A level of constant atmospheric pressure related to a reference datum of 29.92 inches of mercury. Each is stated in three digits that represent hundreds of feet—flight level 250 represents a barometric altimeter indication of 25,000′, flight level 255 as 25,500′. FLIGHT PLAN – Specified information relating to the intended flight of an aircraft, filed orally or in writing with an FSS or an ATC facility. FLIGHT SERVICE STATION (FSS) – Air traffic facilities which provide pilot briefing, enroute communications and VFR search and rescue services, assist lost aircraft and aircraft in emergency situations, relay ATC clearances, originate Notices to Airmen, broadcast aviation weather and NAS information, receive and process IFR flight plans, and monitor NAVAIDs. In addition, at selected locations, FSSs provide Enroute Flight Advisory Service (Flight Watch), take weather observations, issue airport advisories, and advise Customs and Immigration of transborder flights. FLOATPLANE – A water-based aircraft with one or more mounted pontoons, as differentiated from a hulled SEAPLANE [Flying Boat], but often used generically. FLYING WIRES – Interplane bracing wires that help support wingloads when the plane is in flight. Direction of travel is upward and outward from the fuselage to the interplane struts. Also known as LIFT WIRES, the opposite of LANDING WIRES. FOWLER FLAP – Trademark name of a split-flap attached to a wing’s trailing edge with a system of tracks and rollers to roll the FLAP backward and downward, increasing the wing area. Named for its inventor, USAAF engineer Harland D Fowler. FRISE AILERON – A type of aileron that has a beveled leading edge projecting beyond its inset hinges. When lowered, it forms an extension of the wing surface; when raised, its nose protrudes below the wing, increasing DRAG and reducing YAW. Named for its inventor, British engineer Leslie George Frise. FUSELAGE – An aircraft’s main body structure housing the flight crew, passengers, and cargo and to which the wings, tail and, in most single-engined airplanes, engine are attached. French: fuselé, tapering. GAP – The distance between two adjacent wings of a biplane or multiplane. GCA – Ground-Controlled Approach; part of ILS. GENERAL AVIATION – That portion of civil aviation which encompasses all facets of aviation except air carriers holding a certificate of public convenience and necessity from the Civil Aeronautics Board and large aircraft commercial operators. GEOGRAPHIC NORTH – The northern axis around which the Earth revolves; aka “Map North” and TRUE NORTH. Also see MAGNETIC NORTH. GLASS COCKPIT – Said of an aircraft’s control cabin which has all-electronic, digital and computer-based, instrumentation. GLIDER – An unpowered aircraft capable of maintaining altitude only briefly after release from tow, then gliding to earth. Compare SAILPLANE. GLIDE SLOPE – (1) The angle between horizontal and the glide path of an aircraft. (2) A tightly-focused radio beam transmitted from the approach end of a runway indicating the minimum approach angle that will clear all obstacles; one component of an instrument landing system (ILS). GPS – Global Positioning System; satellite-based navigation. GREEN LIGHT – Approval for landing. A carryover expression from days when aircraft for the most part had no radios, and communication from a control tower was by means of a light-gun that beamed various green, red, and yellow signals to pilots in the air and on the ground. A popular phrase, “3 green lights,” refers to the instrument panel lights verifying that all three gears (in a tri-gear aircraft) are down and locked for safe landing. GROSS WEIGHT – The total weight of an aircraft when fully loaded, including fuel, cargo, and passengers; aka Takeoff Weight. GROUND CONTROL – Tower control, by radioed instructions from air traffic control, of aircraft ground movements at an airport. GROUND EFFECT – Increased lift generated by the interaction between a lift system and the ground when an aircraft is within a wingspan distance above the ground. It affects a low-winged aircraft more than a mid- or high-winged aircraft because its wings are closer to the ground; aka GROUND CUSHION. GROUNDSPEED – The actual speed that an aircraft travels over the ground—its “shadow speed”; it combines the aircraft’s AIRSPEED and the wind’s speed relative to the aircraft’s direction of flight. 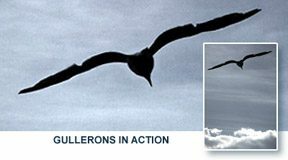 GULL-WING – Descriptive of wing in frontal view bent as the wing of a seagull; a distinctive shallow, inverted “V” shape—see Stinson SR-10 or inverted gull-wing Vought F4U. GYROPLANE – A rotorcraft whose rotors are not engine-driven, except for initial starting, but are made to rotate by action of the air when the rotorcraft is moving and whose means of propulsion, usually a conventional propeller, is independent of the rotor system. Similar to AUTOGYRO. HANGAR – An enclosed structure for housing aircraft. Originated with lake-based floating homes of the original German Zeppelins in which they were “hung” from cables, which explains the erroneous, oft-seen spelling of “hanger.” French: hangar, shed, outbuilding, from Latin: angarium, shed. HELICOPTER – A wingless aircraft acquiring its lift from revolving blades driven by an engine about a near-vertical axis. A ROTORCRAFT acquiring its primary motion from engine-driven rotors that accelerate the air downward, providing a reactive lift force, or accelerate the air at an angle to the vertical, providing lift and thrust. HIGH BLOWER – A blower-type supercharger set at high rpm. HIGH-SPEED STALL – Any stall made to occur at more than 1g, such as pulling out of a dive or while turning. HORSEPOWER – The motive energy required to raise 550# one foot in one second, friction disregarded. HYPERSONIC – Speed of flight at or greater than Mach 5.0, exceeding SUPERSONIC. HYPOXIA – Deprivation of oxygen, aka “altitude sickness,” which can adversely affect human judgment and movement at altitudes above 12,000′ with symptoms ranging from light dizziness to unconsciousness, even death at the extreme. It was a principal reason for pressurized aircraft. IFR – Instrument Flight Rules, governing flight under instrument meteorological conditions. ILS – Instrument Landing System. A radar-based system allowing ILS-equipped aircraft to find a runway and land when clouds may be as low as 200′ (or lower for special circumstances). INDICATED AIRSPEED (IAS) – A direct instrument reading obtained from an air speed indicator uncorrected for altitude, temperature, atmospheric density, or instrument error. Compare CALIBRATED AIRSPEED and TRUE AIRSPEED. INSTRUMENT METEOROLOGICAL CONDITIONS (IMC) – Meteorological conditions expressed in terms of visibility, distance from clouds, and ceiling less than minima specified for visual meteorological conditions (VMC). IRON COMPASS – Railroad tracks, favored by pilots of yore as a dependable aid to surface navigation before radio. JOYSTICK – A single floor- or roof-mounted control stick—sideways movement produces ROLL, and forward/backward movement produces PITCH (rudder pedals produce YAW). KNOT – One nautical mile, about 1.15 statute miles (6,080′); eg: 125kts = 143.9mph. LAMINAR-FLOW AIRFOIL – A low-drag airfoil designed to maintain laminar (smooth, continuous) flow over a high percentage of the CHORD about itself. Often relatively thin, especially along the leading edge, with most of its bulk near the center of the chord. LANDING WIRES – Interplane bracing wires that help support wingloads when the plane is on the ground. Direction of travel is downward and outward from the fuselage. Opposite of FLYING WIRES. LIFT – The force exerted on the top of a moving airfoil as a low-pressure area [vacuum] that causes a wingform to rise. AIRFOILs do not “float” on air, as is often assumed—like a boat hull floats on water—but are “pulled up” [lifted] by low air pressures trying to equalize. LIFT-DRAG RATIO – The lift coefficient of a wing divided by the drag coefficient, as the primary measure of the efficiency of an aircraft; aka L/D Ratio. LIFT WIRES – Interplane bracing wires that help support wingloads when the plane is in flight. Direction of travel is upward from the bottom of the fuselage to the top of the interplane struts. Also known as FLYING WIRES, the opposite of LANDING WIRES. LIGHT SPORT AIRCRAFT – Special FAA certification class (LSA) for an aircraft other than a helicopter or powered-lift—single-engine aircraft, airship, balloon, GLIDER, GYROCOPTER, ROTORCRAFT, weight-shift-control aircraft. While limiting the types of aircraft that could be flown by a Sport Pilot, it simplified requirements for a obtaining a pilot license and did not require a medical examination. See LSA feature. LIQUID COMPASS – A non-electronic, calibratable compass floating in a liquid as a panel instrument; aka WET COMPASS. LOAD FACTOR (g) – The proportion between lift and weight commonly seen as g (sometimes capitalized)—a unit of force equal to the force of gravity times one. LOFTING – Design or fabrication of a complex aircraft component, as with sheet metal, using actual-size patterns or plans, generally laid out on a floor. The term was borrowed from boat builders. LONGERON – A principal longitudinal member of a fuselage’s framing, usually continuous across a number of supporting points. LOOP ANTENNA – A circular radio antenna, either in the open or in a streamlined, teardrop housing, remotely turned 360° to fine-tune a station in league with other radio-directive devices. See also RADIO COMPASS, RADIO DIRECTION FINDER. LORAN – Long Range Navigation system, which utilizes timing differences between multiple low-frequency transmissions to provide accurate latitude/longitude position information to within 50′. LTA – Lighter-than-air craft, generally referring to powered blimps and dirigibles, but often also includes free balloons. LUNKENHEIMER VALVE – A manual fuel drain placed handily along a fuel line for checking avgas, such as for water or sediment contaminations. Mach or m. – A number representing the ratio of the speed of an object to the speed of sound in the surrounding air or medium in which it is moving. MAGNETIC COMPASS – The most common liquid-type compass, capable of calibration to compensate for magnetic influences within the aircraft. MAGNETIC COURSE – COMPASS COURSE ± deviation. MAGNETIC NORTH – The magnetic North pole, located near 71° North latitude and 96° West longitude, that attracts a magnetic compass which is not influenced by local magnetic attraction, as opposed to GEOGRAPHIC NORTH. MAGNETO, MAG – An accessory that produces and distributes a high-voltage electric current for ignition of a fuel charge in an internal combustion engine. MAGNUS EFFECT – The effect on a spinning cylinder or sphere moving through a fluid, in which force acts perpendicular to the direction of motion and to the direction of spin. This is used to advantage in baseball, in which the trajectory of a pitched ball is a distinct curve. Applied to aeronautics in experimental wingforms, the Magnus Theory states that if air is directed against a smooth, revolving cylinder, whose circumferential speed is greater than that of the air current, a force is directed against one side of the cylinder—air compressed on one side and vacuum formed on the other—creating lift. Named for physicist Heinrich Gustav Magnus (1802-70). MONOCOQUE – Type of fuselage design with little or no internal bracing other than bulkheads, where the outer skin bears the main stresses; usually round or oval in cross-section. Additional classifications are (1) Semi-Monocoque, where the skin is reinforced by longerons or bulkheads, but with no diagonal web members, and (2) Reinforced Shell, in which the skin is supported by a complete framework or structural members. French: monocoque, single shell. MSL – Mean Sea Level. The average height of the surface of the sea for all stages of tide; used as a reference for elevations, and differentiated from AGL. NACELLE – A streamlined enclosure or housing to protect something such as the crew, engine, or landing gear. French: nacelle, from Latin, navicella, little ship. NATIONAL AIRSPACE SYSTEM (NAS) – The common network of US airspace; air navigation facilities, equipment and services, airports or landing areas; aeronautical charts, information and services; rules, regulations and procedures, technical information, and human resources and material. Included are system components shared jointly with the military. NDB – Non-Directional Beacon. An LF, MF, or UHF radio beacon transmitting non-directional signals whereby the pilot of an aircraft equipped with direction finding equipment can determine his bearing to or from the radio beacon and “home” on or track to or from the station. When the radio beacon is installed in conjuncion with the Instrument Landing System (ILS) marker, it is normally called a Compass Locator. ON THE BEAM – A leftover phrase from ADCOCK Radio Range days still means the same thing today—”You are headed in the right direction,” as when you you hear a steady broadcast tone beamed from your target radio transmitter. Also as RIDING THE BEAM. OVERSHOOT – To land beyond a runwway or planned spot. Opposite of UNDERSHOOT. PANTS – A popular word for streamlined, non-load bearing fairings to cover landing wheels. Also sometimes called Spats or, when fully enclosing the wheel struts, Skirts. PATTERN – The path of aircraft traffic around an airfield, at an established height and direction. At tower-controlled fields the pattern is supervised by radio (or, in non-radio or emergency conditions by red and green light signals) by air traffic controllers. PAYLOAD – Anything that an aircraft carries beyond what is required for its operation during flight, theoretically that from which revenue is derived, such as cargo and passengers. PILOT IN COMMAND (PiC) – The pilot responsible for the operation and safety of an aircraft during flight time. PITCH – (1) Of the three axes in flight, this specifies the vertical action, the up-and-down movement. Compare ROLL and YAW. (2) The angle of a propeller or rotor blade in relation to its arc; also the distance advanced by a blade in one full rotation. PITOT TUBE – More accurately but less popularly used, Pitot-Static Tube, a small tube most often mounted on the outward leading edge of an airplane wing (out of the propeller stream) that measures the impact pressure of the air it meets in flight, working in conjuction with a closed, perforated, coaxial tube that measures the static pressure. The difference in pressures is calibrated as air speed by a panel instrument. Named for French scientist Henri Pitot (1695-1771). POSITIVE CONTROL – The separation of all air traffic within designated airspace by air traffic control. POWER LOADING – The GROSS WEIGHT of an airplane divided by the rated horsepower, computed for Standard Air density. PUSHER – A propeller mounted in back of its engine, pushing an aircraft through the air, as opposed to a TRACTOR configuration. QUADRAPLANE, QUADRUPLANE – An aircraft having four or more wingforms. RAMJET – An aerodynamic duct in which fuel is burned to produce a high-velocity propulsive jet. It needs to be accelerated to high speed before it can become operative. RIDING THE BEAM see ON THE BEAM. RING COWLING – A circular engine FAIRING. ROGALLO WING – A flexible, delta-wing plan in which three rigid members are shaped in the form of an arrowhead and joined by a flexible fabric, which inflates upward under flight loads. Originally specific to paragliders, but now found on some powered aircraft. ROLL – Of the three axes in flight, this specifies the action around a central point. Compare PITCH and YAW. ROTARY ENGINE – A powerplant that rotates on a stationary propeller shaft. An American invention by Adams-Farwell Co (1896), it was first used for buses and trucks in the US (1903), then copied by French engineers for early aircraft engines (1914). ROTORCRAFT – A heavier-than-air aircraft that depends principally for its support in flight on the lift generated by one or more rotors. Includes helicopters and gyroplanes. RUDDER – The movable part of a vertical airfoil which controls the YAW of an aircraft; the fixed part being the FIN. SAILPLANE – An unpowered, soaring aircraft capable of maintaining level flight for long periods of time after release from tow and of gaining altitude using wind currents, as opposed to a GLIDER. SCRAMJET – Acronym for supersonic combustion ramjet, in which combustion occurs at supersonic air velocities through the engine. SCUD – A low, foglike cloud layer. SEAPLANE – A water-based aircraft with a boat-hull fuselage, often amphibious.The term is also used generically to define a similar Flying Boat and a pontoon FLOATPLANE. SECONDARY STALL – Any stall resulting from pulling back too soon and too hard while recovering from any other stall. Usually a HIGH-SPEED or ACCELERATED STALL. SERVICE CEILING – The height above sea level at which an aircraft with normal rated load is unable to climb faster than 100′ per minute under Standard Air conditions. SESQUI-WING – A lesser-span additional wingform, generally placed below the main planes of an aircraft, generally a biplane. SHOULDER-WING – A mid-wing monoplane with its wing mounted directly to the top of the fuselage without use of CABANE STRUTs. SIDESLIP – A movement of an aircraft in which a relative flow of air moves along the lateral axis, resulting in a sideways movement from a projected flight path, especially a downward slip toward the inside of a banked turn. SINK, SINKING SPEED – The speed at which an aircraft loses altitude, especially in a glide in still air under given conditions of equilibrium. SKID – Too shallow a bank in a turn, causing an aircraft to slide outward from its ideal turning path. SLATS – Movable vanes or auxiliary airfoils, usually set along the leading edge of a wing but able to be lifted away at certain angles of attack. SLIP – Too steep a bank in a turn, causing an aircraft to slide inward from its ideal turning path. SLIPSTREAM – The flow of air driven backward by a propeller or downward by a rotor. Compare DOWNWASH. SLOT – A long, narrow, spanwise gap in a wing, usually near the leading edge, to improve airflow at high angles of attack for slower landing speeds. SLOTTED FLAP – A flap that, when depressed, exposes a SLOT and increases airflow between itself and the rear edge of the wing. SMOH – “Since Major Overhaul,” an acronym seen in reference to the operating hours, or time remaining, on an engine. Alert Area – Airspace which may contain a high volume of pilot training activities or an unusual type of aerial activity, neither of which is hazardous to aircraft. Alert Areas are depicted on aeronautical charts for the information of non-participating pilots. All activities within an Alert Area are conducted in accordance with Federal Aviation Regulations, and pilots of participating aircraft as well as pilots transiting the area are equally responsible for collision avoidance. Military Operations Area (MOA) – Airspace established outside of Class A airspace area to separate or segregate certain non-hazardous military activities from IFR traffic and to identify for VFR traffic where these activities are conducted. Prohibited Area – Airspace designated under part 73 within which no person may operate an aircraft without the permission of the using agency. Restricted Area – Airspace designated under FAR Part 73, within which the flight of aircraft, while not wholly prohibited, is subject to restriction. Most restricted areas are designated joint use and IFR/VFR operations in the area may be authorized by the controlling ATC facility when it is not being utilized by the using agency. Restricted areas are depicted on enroute charts. Where joint use is authorized, the name of the ATC controlling facility is also shown. Warning Area – A warning area is airspace of defined dimensions extending from 3 nautical miles outward from the coast of the USA, that contains activity that may be hazardous to non-participating aircraft. The purpose of such warning area is to warn non-participating pilots of the potential danger. A warning area may be located over domestic or international waters or both. SPLIT FLAP – A FLAP built into the underside of a wing, as opposed to a Full Flap wherein a whole portion of the trailing edge is used. SPOILER – A long, movable, narrow plate along the upper surface of an airplane wing used to reduce lift and increase drag by breaking or spoiling the smoothness of the airflow. SPORT PILOT – Special FAA certification enabling “budget” pilotry; see LIGHT SPORT AIRCRAFT and LSA feature. SPONSON – A short, winglike protuberance on each side of a seaplane fuselage to increase lateral stability. STABILATOR – A movable horizontal tail that combines the actions of a stabilizer and elevator, increasing longitudinal stability while creating a pitching moment. STABILIZER – The fixed part of a horizontal airfoil that controls the pitch of an aircraft; the movable part being the ELEVATOR. STAGGER – The relative longitudinal position of the wings on a biplane. Positive Stagger is when the upper wing’s leading edge is in advance of that of the lower wing [eg: Waco YKS], and vice versa for Negative Stagger [eg: Beechcraft D17]. STALL – (1) Sudden loss of lift when the angle of attack increases to a point where the flow of air breaks away from a wing or airfoil, causing it to drop. (2) A maneuver initiated by the steep raising of an aircraft’s nose, resulting in a loss of velocity and an abrupt drop. STANDARD AIR (Standard Atmosphere) – An arbitrary atmosphere established for calibration of aircraft instruments. Standard Air Density is 29.92 inches of mercury and temperature of 59° F, equivalent to an atmospheric air pressure of 14.7# per square inch. STANDARD RATE TURN – A turn in which the heading of an aircraft changes 3° per second, or 360° in two minutes. STATIC WIRE – A clip-on wire used to ground an aircraft by drawing off static electricity, a potential fire hazard, during refueling. SUPERSONIC – Speed of flight at or greater than Mach 1.0; literally, faster than the speed of sound. SWEEPBACK – A backward inclination of an airfoil from root to tip in a way that causes the leading edge and often the trailing edge to meet relative wind obliquely, as wingforms that are swept back. SWING-WING – A wing whose horizontal angle to the fuselage centerline can be adjusted in flight to vary aircraft motion at differing speeds. TARMAC – (1) A bituminous material used in paving; a trade name for Tar MacAdam. (2) An airport surface paved with this substance, especially a runway or an APRON at a hangar. TAS – True Air Speed. Because an air speed indicator indicates true air speed only under standard sea-level conditions, true air speed is usually calculated by adjusting an Indicated Air speed according to temperature, density, and pressure. Compare CALIBRATED AIR SPEED and INDICATED AIR SPEED. TERMINAL RADAR SERVICE AREA (TRSA) – Airspace surrounding designated airports wherein ATC provides radar vectoring, sequencing, and separation on a full-time basis for all IFR and participating VFR aircraft. Service provided at a TRSA is called Stage III Service. TRSAs are depicted on VFR aeronautical charts. Pilot participation is urged but is not mandatory. TETRAHEDRON – Ground-based, free-rotating, triangular-shaped wind direction indicator, generally placed near a runway, often lighted at major airports. THRUST – The driving force of a propeller in the line of its shaft or the forward force produced in reaction to the gases expelled rearward from a jet or rocket engine. Opposite of DRAG. TORQUE – A twisting, gyroscopic force acting in opposition to an axis of rotation, such as with a turning propeller; aka Torsion. TOUCH-AND-GO – Landing practice in which an aircraft does not make a full stop after a landing, but proceeds immediately to another take-off. TRACTOR – A propeller mounted in front of its engine, pulling an aircraft through the air, as opposed to a PUSHER configuration. TRAILING EDGE – The rearmost edge of an AIRFOIL. TRANSPONDER – An airborne transmitter that responds to ground-based interrogation signals to provide air traffic controllers with more accurate and reliable position information than would be possible with “passive” radar; may also provide air traffic control with an aircraft’s altitude. TRIKE – Nickname for a weight-shift-control aircraft, such as a paraglider. TRIM TAB – A small, auxiliary control surface in the trailing edge of a wingform, adjustable mechanically or by hand, to counteract (“trim”) aerodynamic forces on the main control surfaces. TRUE AIRSPEED – The speed of an aircraft along its flight path, in respect to the body of air (air mass) through which the aircraft is moving. Also see CALIBRATED AIRSPEED, GROUND SPEED, INDICATED AIRSPEED. TRUE NORTH – The northern direction of the axis of the Earth; aka “Map North.” GEOGRAPHIC NORTH, as opposed to MAGNETIC NORTH. TURBOJET – An aircraft having a jet engine in which the energy of the jet operates a turbine that in turn operates the air compressor. TURBOPROP – An aircraft having a jet engine in which the energy of the jet operates a turbine that drives the propeller. TURN & BANK INDICATOR – Primary air-driven gyro instrument, a combined turn indicator and lateral inclinometer to show forces on an aircraft in banking turns. Also referred to as “needle & ball” indicator, the needle as the gyro’s pointer and a ball encased in a liquid-filled, curved tube. TWILIGHT ZONE – Long before Rod Serling’s tv series was this consumer-lever definition for a glitch in the ADCOCK RANGE, officially called a Bi-Signal Zone. It was a portion of the overlapping area of a beam where the continuous monotone “on-course” signal became temporarily overlayed with the “A” or “N” code signals. ULTRALIGHT – An aeronautical vehicle, operated for sport or recreational purposes, that does not require FAA registration, an airworthiness certificate, or pilot certification. Primarily single-occupant vehicles, although some two-place vehicles are authorized for training purposes. Operation of an ultralight vehicle in certain airspaces requires authorization from ATC. UNCONTROLLED AIRSPACE – Class G Airspace; airspace not designated as Class A, B, C, D or E.
UNDERCARRIAGE – The landing gear of a land-based aircraft, including struts, frames, and wheels. A very British word that has limited use in the USA. UNDERSHOOT – To land short of a runwway or planned landing spot. Opposite is OVERSHOOT. UNICOM – Universal Communication. A common radio frequency (usually 121.0 mHz) used at uncontrolled (non-tower) airports for local pilot communication. UPWASH – The slight, upward flow of air just prior to its reaching the leading edge of a rapidly moving airfoil. UPWIND TURN – Long a point of contest among pilots, there is in reality no such thing as far as the airplane is concerned. Proponents claim that airplanes lose air speed when turning upwind, while opponents (and the laws of physics) argue that an airplane, like a boat in a river whose speed is only relative to the water and not the shore, is unaffected within the movement of an air mass and that it loses only ground speed. USEFUL LOAD – The weight of crew, passengers, fuel, baggage, and ballast, generally excluding emergency or portable equipment and ordnance. VARIOMETER – A panel instrument, often as simple as a tiny ball in a vertical tube, indicating subtle PITCH movements of an aircraft. Popular use in SAILPLANES. VENTRAL FIN – A fin/rudder extension on the bottom of a fuselage. Opposite of DORSAL FIN. VENTURI TUBE – A small, hourglass-shaped metal tube, usually set laterally on a fuselage in the slipstream to create suction for gyroscopic panel instruments. Now outdated by more sophisticated means. VFR – Visual Flight Rules that govern the procedures for conducting flight under visual conditions. The term is also used in the US to indicate weather conditions that are equal to or greater than minimum VFR requirements. Also used by pilots and controllers to indicate a specific type of flight plan. VFR ON TOP – Flight in which a cloud ceiling exists but modified VISUAL FLIGHT RULES are in effect if the aircraft travels above the cloud layer. VISUAL METEOROLOGICAL CONDITIONS (VMC) – Meteorological conditions expressed in terms of visibility, distance from clouds, and ceiling equal to or better than specified minima. VOR – VHF OmniRange. A ground-based navigation aid transmitting very high-frequency (VHF) navigation signals 360° in azimuth, on radials oriented from MAGNETIC NORTH. The VOR periodically identifies itself by Morse Code and may have an additional voice identification feature. Voice features can be used by ATC or FSS for transmitting information to pilots. VORTAC – VOR + TACAN (Tactical Air Navigation); combined radio navigation aids. VSI – Vertical Speed Indicator. A panel instrument that gauges rate of climb or descent in feet-per-minute (fpm). Also Rate Of Climb Indicator. YAW – Of the three axes in flight, this specifies the side-to-side movement of an aircraft on its vertical axis, as in skewing. Compare PITCH and ROLL.